Chemical industry is the mainstay of industrial and agricultural development of the country and provides building blocks for several downstream industries such as textiles, papers,paints, soaps, detergents, pharmaceuticals, varnish etc. Covering more than 80,000 products, this industry services large number of end use application industries. In India it is estimated that more than 2 Mn people are employed in this industry. Indian chemical industry comprises of both small scale as well as large scale units. With initiatives like "Make in India" program gaining steam, investments, innovation and infrastructure are going to be the major thrust areas for chemical industry players. The current per capita consumption of chemical products in India is about 1/10th of the world average, indicating that the demand potential is yet to be realized. 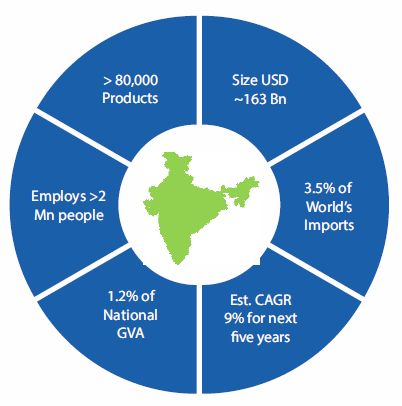 Moreover, India has a very strong outlook for the key end user industries. Going ahead, it is estimated that the demand of chemical products is expected to grow at ~9% p.a. over the next five years and is pegged at 1.2X GDP growth. Globally, chemical industry is estimated at $ 4.7 Tn in 2017 it is also driven by demand from end use industries. Indian chemical industry is estimated to be valued at $163 Bn in 2017 and contributes 3.4% to the global chemical industry. It ranks 14th in exports and 8th in imports of chemicals (excluding pharmaceutical products) globally. Production of Petrochemicals have marginally increased by 1.1% over last year and chemicals have grown by 8%. Production growth in chemicals are mainly driven by products of Chlore-Alkali Industry (Caustic Soda, Soda Ash and Liquid Chlorine).